Scattered showers expected throughout the week. Sunday morning started on a mild note with temperatures in the lower 70s, with a mix of sun and clouds. Plan on a breezy day, with winds out of the East at 10-15 mph. A few scattered showers are expected to come ashore due to the breeze today. Also, a few more clouds than yesterday will be expected because of the easterly flow. Highs will be in the low 80s. A few showers could pop onshore tonight as well, with breezy conditions. Lows tonight will be in the low 70s. 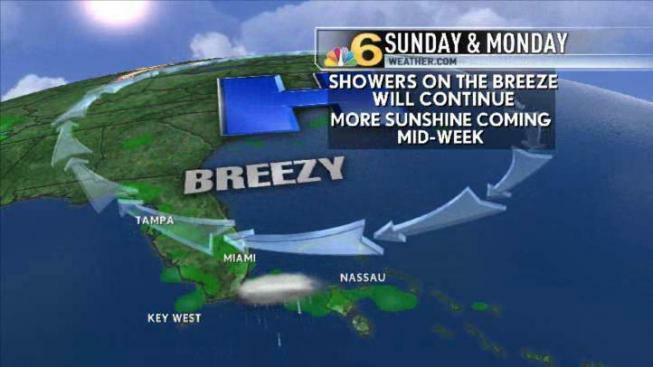 Plan on the breeze to stick around for a few days with scattered showers throughout the week. If you haven't done it yet, set your clocks forward one hour.